Never has the old adage "Good help is hard to find" been more truthful than in my recent struggle to find a coherent, intelligent, and evolved Personal Assistant. They are all worthless and their incompetence makes me want to squish them with a patented head scissor takedown. 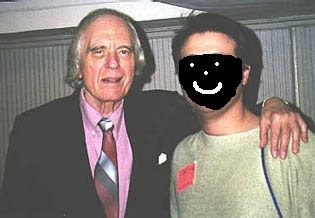 For example, I sent my recent hire to do a simple thing: take notes at an Angus Scrimm appearance and screening of the horror classic Phantasm. I gave him plenty of notepaper. I bought a nice pencil for him. I even paid for his ticket. And he dares to bring back the gibberish below. I've transcribed his notes, misspellings, nonsense, and all. If you can interpret any of this please let me know. This is part one of three. 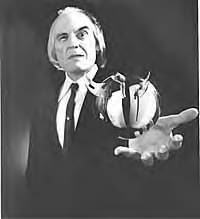 Angus Scrimm for Phantasm screeing. playing evil person? nice, public persona. involvment w/ Don Coscarelli - work -0 since college. Universal picked it oup - not a big hit. Horror - 1st choice "& thus began the Phantasm saga ..."
Q: collaborative creation of Tall Man? thought of silent horror actors? AS - "(I was) dismayed I had no more lines - few lines added to sinister quality. not sure if more dialog in the sequels was a good idea as an actor,"
Always questions unanswered - "part of its charm"
only time I see a movie is if a friend is in it. - To me, horror is really black and white. - Glass Eye pictures in NY. "Wendigo" "Habit" "No Telling"
-Jim McKeany - "Cannibalistic" auto accident - "Off Season" - ghost story. AS: last Faal - lottery picked him to be one of 2200 to see all & pick SAG awards. - lots of invites. AS: Stargazer "endless array of incredible people"
remake of Phantasm with Tony Todd - "oh hey"
Don has at least four scrips for sequel. Marvelous reunion and complete buffet of cold cuts. the music/theme - "completely original by _____. Coscarelli's scorer until he died. Immortalized in rock songs. - "Not sure I've heard that - I think at five or six songs that pinched theme or "boy". Fangoria - Mindwarp (?) with Bruce Campbell. recently - they're so forgettable so I forgot them. cartoon voice? Host Aqua teen Halloween show. Disney series - Super Robot Monkey something or other. 80s slashers? obviously enormously success at box office & who can argue with that? "I tend not to like slasher films. I don't like seeing nice young kids slashed to death. Have turned town four or five roles in which that's the entertainment content . - Won't slash pleading young girls"
Home - Valley College, LA. grew up in Kansas City, Kansas - right on the line. went to Hollywood at sixteen years old in the middle of World War II - "& I'm still tring to scratch out a career"
Price, Cushing, Lee - inspired? 'little girl from Frankenstie "Mr Scrimm if I give you my picture, will you have me yours?" History of screen name - "lost in the missts of time. Zeke Slad was in (a) play - '43 short story? couldn't act off campus. with P (Paramount?) - let's use Angus Scrimm. Caravan Juliet is a mountain town. Truck stalled - wait for repair. Riding with Don's mother. tepee joke. Kathy I wonder what it'd be like to live in a tepee - that wouldn't be very tepee-cal of you - you won't be able to keep your wigwam. Dry ice in Phantasm - on street - "always asked" - allergic to cold. could be destroyed by it. well its' a kind of horror film with comedy - what do you play? FGP is Back and What's New with Queue?